Noninvasive assessments of skin glycated proteins by fluorescence and Raman techniques in diabetics and nondiabetics. PAOLILLO, Fernanda R.; MATTOS, Vicente S.; OLIVEIRA, André O. de; GUIMARÃES, Francisco Eduardo Gontijo; BAGNATO, Vanderlei Salvador; CASTRO NETO, Jarbas Caiado. Abstract: Diabetes is a complex metabolic disease and has chronic complications. It has been considered a serious public health problem. The aim of the current study was to evaluate skin glycated proteins through fluorescence and Raman techniques. One hundred subjects were invited to participate in the study. Six volunteers did not attend due to exclusion criteria or a change of mind about participating. Therefore, 94 volunteers were grouped according to age range (20-80 years), health condition (nondiabetic, with insulin resistance [IR] and/or diabetic) and Fitzpatrick skin type (I-VI). The fluorescence spectrometer and the portable Raman spectroscopy system were used to measure glycated proteins from the skin. 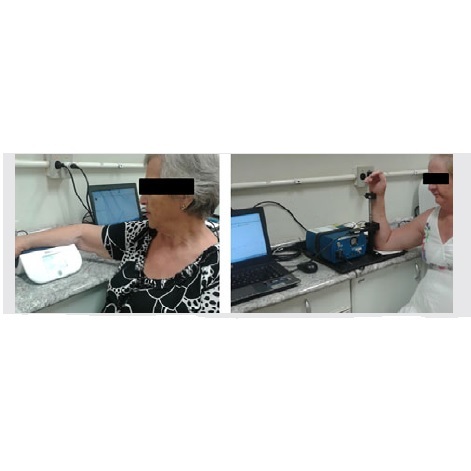 There was elevated skin autofluorescence in healthy middle-aged and elderly subjects, as well as in patients with IR and/or diabetes. Regarding Raman spectroscopy, changes in the skin hydration state, degradation of type I collagen and greater glycation were related for diabetes and chronological aging. Weak and positive correlation between the skin autofluorescence and the Raman peaks ratio (855/876) related to the glycated proteins was also found. Raman spectroscopy shows several bands for spectral analyses, complementing the fluorescence data. Therefore, this study contributes to understanding of the optical of human skin for noninvasive diabetes screening.